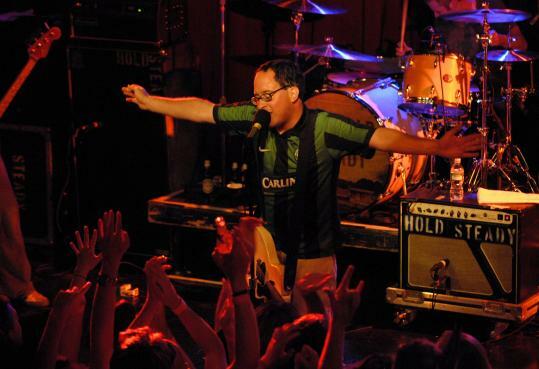 The Hold Steady arrived in our town on Thursday like Pied Pipers of the indie nation, come to lure the children away from all things uptight and unthrilling with the most seductive tools in modern youthdom: rousing power chords, group chants, and the promise of redemption, stoner-style. It was a free show, the opening night in a string of warm-up dates before the launch of the Hold Steady's Constructive Summer tour, and the first official performance of songs from "Stay Positive," the band's irresistible fourth album - all of which helps explain the ultra-exuberant vibe in the room. We're not in the habit of reviewing crowds, but this one was magnificent. Beer was spraying, arms were outstretched, and fans were genuflecting (literally) at the lip of the stage before the first chorus kicked in. "We're gonna build something!" promised Craig Finn, a gleeful geek-savior in khakis and spectacles, and they did: a kinetic collision of storytelling and riffage that restored faith in the galvanizing power of a rock tune. If that sounds more than faintly Springsteenian, it is. There were moments of transcendental homage when communal howls of "Bruuuuuuce" wouldn't have seemed out of place. But while early Boss is an unfashionable starting point for Brooklyn-based heroics, the Hold Steady's obliviousness to fashion speaks to a musical value system unburdened by current trends. That's not to say the Hold Steady isn't burdened. Finn's narratives are strewn with losers, druggies, crazies, and hustlers whose plights he chronicles with literary detail and true empathy. But like all great anthems, the Hold Steady's float the possibility of escape - not from small-town Jersey on the back of a fast bike, but from the church or the law or your own bad self, generally on the wings of quality contraband or possibly, as the new album title proposes, the right outlook. Like all great frontmen, Finn led by example. He grinned delivering the witness statement in "Sequestered in Memphis," pounded his heart in double-time defending the cutter in "Your Little Hoodrat Friend," and conjured the Bible-toting degenerates in "Cattle and the Creeping Things" with disarming effusion. And so it went, on lean, wired deep cuts ("Knuckles," "Hot Fries," "Stevie Nix") and a fresh crop of freedom songs from the fringes including triumphant "Magazines," metal-fueled "Navy Sheets," ebullient "Slapped Actress," and one warm, accordion-stoked waltz called "Lord, I'm Discouraged." The crispness and luminosity of the new recordings (available digitally at iTunes and out on disc July 15) was all but lost, traded for a scruffy intensity more suited to, and a lot easier to produce, in a boozy nightclub. Nobody seemed to care. With all that trouble to outrun, nuance was hardly the point. Boston rockers Aberdeen City opened the show with a set of smart, artful rock that begged the perennial question: When is the rest of the world going to discover this band? They also quelled gossip about the group's imminent demise with the announcement that Thursday's show wasn't, as rumored, Aberdeen City's farewell performance. It was, however, guitarist Ryan Heller's final appearance as an official band member; he's off to grad school in New York. A new Aberdeen City album is due in the coming months. Joan Anderman can be reached at anderman@globe.com. For more on music, visit boston.com/ae/music/blog.